Soup Season is here, or it ought to be. The topic of conversation at my weekly Weight Watchers meetings has been about how we have 12 weeks remaining for the year. 12 weeks can you believe it? Our leader discussed ways to realize our goals and dreams and remake ourselves over in the next 12 weeks. Soup is a part of the 12 week/12 step program. Go figure. It was the first topic covered last week and is one of the smarter food choices you can make when trying to lose weight. The idea is that soup is nourishing, filling and should be full of low-point and good for you vegetables. Like the ad states, Soup is Good Food. I very much enjoy making soup but I don't enjoy eating it nearly as much. It's a mental/stomach thing. I love the way I can make a lot of soup from few ingredients. I love that I can pack in tons of flavors with minimal effort. When I worked at the mostly vegetarian restaurant at the Reading Terminal Market, soups were our main menu items. I was the soup queen when I worked at Whole Foods Market, making stocks from the hundreds of rotisserie chicken carcasses and creating good food from almost nothing. Soup appeals to the frugal side of my soul. However, I haven't always been satisfied with eating soup because as an over-eater, I often find myself wanting a more hearty meal. Loads of bread, sandwiches, a fat-laden meat and potatoes kind of meal. 65 pounds ago (yep, it's official, I've now lost 65 pounds), I liked soup, but it was not my first meal choice. Now I see the error of my ways. Start off with a vegetable based soup and you may find that you will eat less, or at least eat the rest of your meal slower, while filling up quickly. 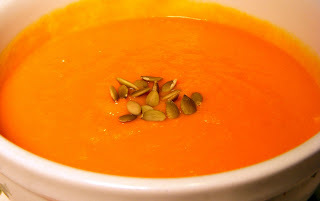 As the topic at my Monday Night WW meeting lead to discussions on how to make healthier soups, I wanted to share this version of a carrot puree soup. Once again, it's a variation on an old favorite of mine. Usually I use an Idaho potato, but with it being pumpkin season, I switched out the potato for the pumpkin. I found this version to be creamier and more visually appealing. It is practically non-fat and completely vegetarian/vegan. It's basically a five ingredient dish, not counting salt, pepper, oil and water: Carrots, Onions, Garlic, Ginger and Pumpkin Puree. It takes about an hour to make which is mostly the cooking time. Here's a step by step how to for this extremely satisfying and curiously creamy vegan low-fat soup. In a large heavy bottomed stock pot, heat the tablespoon of olive oil over medium-high heat until it shimmers. Saute/sweat the onions and carrots for about 8 minutes, until the onions turn translucent, the carrots start to release their water and the onions are starting to take on a golden color. Add in the minced ginger and garlic and stir to combine. Pour in 4 cups of cold water and bring the mixture to a boil. Reduce heat; add the 2 teaspoons of salt and keep the mixture at a gentle simmer for about 25 minutes. Check the soup, when the carrots are fork tender but not falling completely apart turn the heat off. Strain the solids from the liquid, reserving the broth. Set the vegetables aside in a large bowl for about 10 minutes to cool before pureeing. 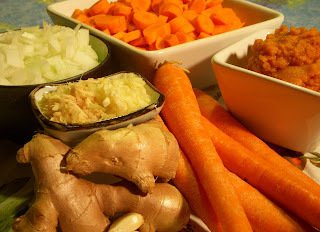 Working in small batches, puree the carrot, onion and ginger mixture in a food processor or blender - CAREFULLY! The vegetables are still hot and will feel like napalm on your skin if it splashes on you! 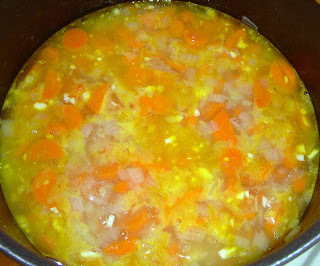 Use some of the reserved broth to thin the soup and to get the puree to whiz in the food processor or blender. Add each batch of puree back to the stock pot. 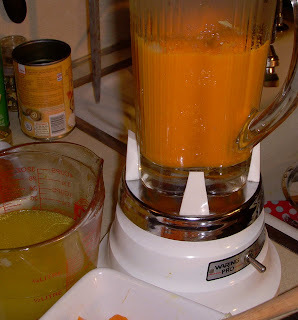 When you are finished pureeing the carrot mixture, stir in the cup of pumpkin puree and any remaining broth. Stir thoroughly to combine. Taste and adjust seasonings with salt and white pepper. Use white pepper, since the black would appear as annoying little specks, and this soup is all about the gorgeous orange color. Serve hot with pumpkin seeds as a garnish (optional). Makes about 6 cups of soup. On the Road to the World Series!